Cardiff City have confirmed former captain and defender Scott Young as assistant manager to Russell Slade. Young, along with Danny Gabbidon, was in caretaker charge after Ole Gunnar Solskjaer stepped down on 18 September. They were at the helm for five games before former Leyton Orient manager Slade took over on 6 October. "It's a massive honour for me to be assistant manager at this football club," said Young, who has managed Port Talbot and AFC Porth. "It's been a hectic two weeks since I came into the first-team environment but I'm relieved just to get it sorted now. "Hopefully in the future I can sort things out and get moving forward." Young made more than 250 appearances for Cardiff between 1993 and 2004 and scored the winning goal in the FA Cup win over Leeds United in 2002. 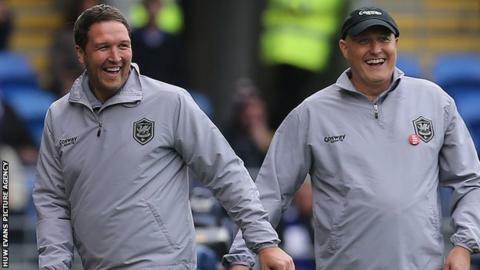 "Scott is a Cardiff man - he is entwined with this football club and wants to see us flourish and succeed," Slade said. "He has been extremely supportive to me since I've come in and appears to be relishing in his new role at Cardiff City. "He will be an integral part of what we do as we move forward." Slade has also added Martyn Margetson, James Rowberry and Kevin Nicholson to his backroom staff. Margetson has returned as goalkeeping coach with Rowberry and Nicholson confirmed as first-team coaches and Wales defender Gabbidon continuing as player-coach. "I'm delighted with the four appointments," Slade told Cardiff City's website. "Scott, Martyn, James and Kevin are key additions to my backroom team, bringing experience, talent, enthusiasm and passion to our Football Club."